This stage was initially straight forward with the goal of keeping Alberto Contador safely in the bunch. 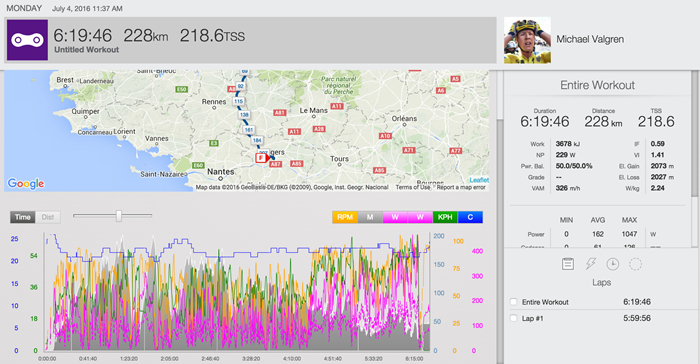 For the first hour of racing, Valgren’s Normalized Power®(NP®) was 248W. After an unfortunate crash by Alberto Contador, Valgren helped pace him back to the peloton. Valgren set most of his Peak Power values during this section of the race, including a Peak 20 Minute Power of 332W, or 4.59W/kg. This big acceleration in the middle of the stage lead to a very high Variability Index® (VI®) of 1.32. After geting back into the bunch, Valgren rode another 90 minutes to the finish at an NP of 258W and averaged 46kph, or 28.5mph. Valgren set his Peak 30 second value of 584W, or 8.07W/g, in the final kilometers of the stage. 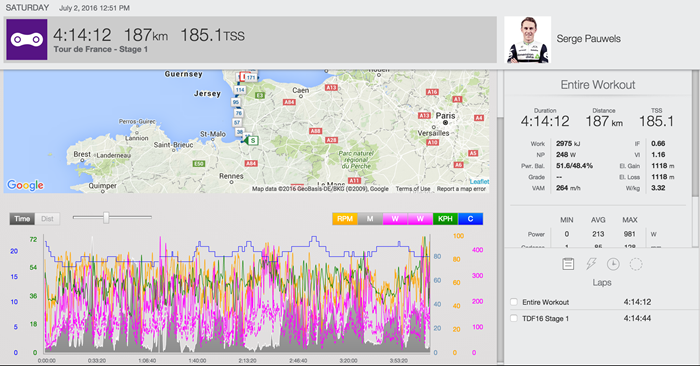 Overall, Valgren’s Average Power was 267W an Intensity Factor (IF) of .68 and a Training Stress Score (TSS) of 220. View Pauwels’ full Rotor 2IN power file. It was a windy start to the race but the peloton rode at an even pace and it was comfortable to stay in the wheels. Mid-stage, Team Etixx upped the pace in the cross winds, but soon after, Alberto Contador crashed and they sat up in respect for a potential winner of the Tour crashing. Into the finale, it was quite relaxed in the last four to five kilometers as the headwind slowed the peloton before we turned to head into the finish. Once the sprinters took over, the pace increased to over seventy kilometres per hour, and it was fantastic for teammate Mark Cavendish to take the win and the first yellow leaders jersey of the Tour de France. All in all, it was good to stay safe and not expend too much energy on stage one. Stage 2 starts in Saint-Lo and travels west towards the coast. While primarily a flat day, riders will tackle three category 4 climbs before reaching the eastern coast. Turning north the course actually follows a brief section of Stage 1’s course through Lessay. However, where Stage 1’s course turned inland, Stage 2 will continue up the coast then wrap inland towards the northern coast at Equeurdreville-Hainneville. The big test of the day will be the category 3 climb Cote de La Glacerie to the finish at Cherbourg-en-Cotentin. This climb ascends 169 meters over 3 km with a very steep section around 181-181.5 km. Durbridge put out his Peak Power values late in the stage. His Peak 20 Minute Power of 410W, or 5.22W/kg, came in the final 20km of the stage. Before setting those peak values, Durbridge rode for just over four hours at a Normalized Power® (NP®) of 300W. A Training Stress Score (TSS) of 269.8 and Intensity Factor (IF) of .75 shows that this was not an easy stage for Durbridge. In total, Durbridge averaged 245W, or 3.12W/kg and burned 4195 calories. The second longest stage of this year’s tour starts in Granville, a town riders passed through on the way up the coast during Stage 1. The course travels inland to the east for about 25km before turning south and heading to the only categorized (cat 4) climb of the day up Cote de Villedieu les-Poeles. The remainder of the course continues moving south with an overall net negative elevation through the second half of the ride into Angers. The second longest stage of this year’s Tour, Valgren saved his energy for the final kilometers. His Peak Power values all came at the end of the stage. Valgren’s Intensity Factor (IF) was .59, meaning that he held 59% of his Functional Threshold Power (FTP) for over six hours. For the full stage, Valgren averaged 61rpm and burned 3678 calories. What better way to follow up the 2nd longest stage of the tour than with the year’s longest stage! Stage 4 starts in the historic town of Saumur and travels primarily SSE for 237.5 km ending in the city of Limoges. The course is flat through the first half then the gradient ticks up a notch before the sprint point at Le Dorat at 170 km and the only rated climb of the day a Category 4 Cote de la Maison Neuve at 182 km. The positive gradient continues to 210 km at Bonnac-la-Cote before riders get a primarily false flat downhill to the last straight 2k run into Limoges. 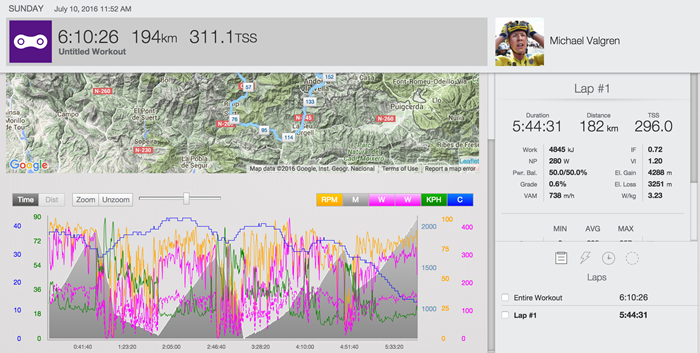 Valgren had a Training Stress Score® (TSS®) of 264 and burned 4195 calories in just over six hours of riding. The first mountain stage of this year’s tour packs in a bit of everything. The stage is long at 216 km and features six categorized climbs. The course starts out in Limoges, where stage 3 finished and heads east to the early first category 4 climb up Côte de Saint-Léonard-de-Noblat. From there the course turns southeast and continues through rolling hills till it turns south at Saint-Angel. At 135 km the gradient starts to kick up with the run into the long near 4% gradient category 3 Côte du Puy Saint-Mary at 142.5 km. The intermediate sprint follows immediately after the first climb at 144.5 km. The road continues to climb to the second category 3 to Col de Neronne. There is a bit of rest descending down after the climb till the final push over the last 35 km of the race which faces two consecutive category 2 climbs up Pas de Peyrol and Col du Perthus followed by the category 3 climb up Col de Font de Cère. The course then descends into Le Lioran before the road kicks up again for the last km to the line. Michael Valgren of Team Tinkoff and Luke Durbridge of Team Orica-BikeExchange had very similar files on this stage. Both set their Peak Power values under 1 minute during the early kilometers of the stage, both set their Peak One Hour Power values during the Cat 2 and Cat 3 climbs towards the end of the stage, and both averaged just over 3W/kg over the stage. Valgren’s Peak Power values for 1 Minute and under were all set very early in the stage while the break of the day was trying to be established. His Peak 1 Minute Power was 504W, or 6.96W/kg and came just 25km into the stage. This was not an easy day in the saddle as Valgren had an Intensity Factor® (IF®) of .69 and Training Stress Score® (TSS®) of 298. The ride was relatively smooth however, as his Variability Index (VI) was 1.21. 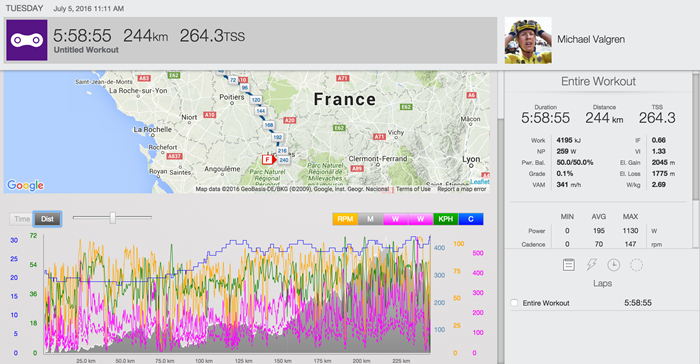 Riding just over six hours, Valgren put out 3.08W/kg and expended 5015 calories. As the break of the stage was being established, Durbridge put out his Peak Power Values under 1 minute. His Peak 30 Second Power was 593W, or 7.55W/kg. Durbridge’s Peak 30 Minute Power was set while riding up the Category 3 Col de Neronne and Category 2 Pas de Peyrol where he averaged 349W, or 4.45W/kg. Durbridge hit a Peak Speed of 94.2kph (58.4mph) and Peak Cadence of 124rpm. Overall, Durbridge had an IF of .71, a TSS of 312 and VI of 1.23, all very similar to the values set by Michael Valgren. Riding just over six hours, Durbridge averaged 3.07W/kg and burned 5397 calories. After a day in the mid mountains the tour returns to a relatively flat stage. The first stage under 200 km in three days at 190.5 km, will be a welcome change for the riders. The course starts heading south out of Arpajon-sur-Cère for the first 32 km. The course then veers more southwest descending into Vieillevie. The first climb of the day is a category 3 climb on the Col des Estaques at 62 km. The road continues on a positive gradient up to the category 4 climb up Côte d’Aubin at 71.5 km. The intermediate sprint comes as riders crest over some smaller non categorized climbs at Montbazens 77.5 km into the race. The remainder of the stage is a net negative gradient but has a couple of non categorized climbs and the category 3 climb up Côte de Saint-Antonin-Noble-Val at 149 km. The finish into Montauban is slightly downhill and riders will contend with a roundabout and two turns in the last 1.5 km. Interestingly, many of Durbridge’s Peak Power values were set at very different parts of the stage. Just 5km into the stage, Durbridge set his Peak 2 and 5 Minute Power values. He put out 417W, or 5.31W/kg for 2 minutes, and 399W, or 5.08W/kg for 5 minutes. 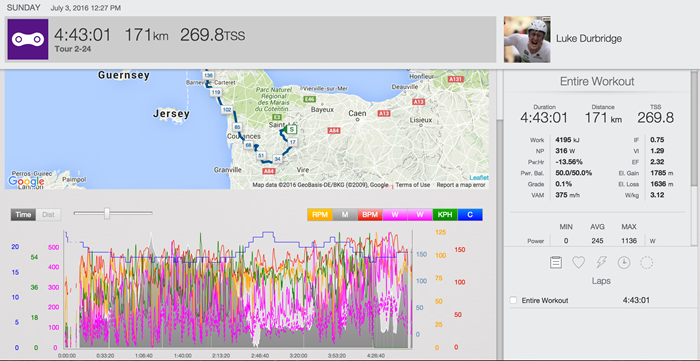 Near the 70km mark, Durbridge set his Peak 20 Minute Power of 279W, or 3.55W/kg climbing the Cat. 3 Cote d’Aubin. On the final climb of the day, the Cat. 3 Cote de Saint-Antonin-Noble-Val, nearly 150km and over four hours into the stage, Durbridge set his Peak 6 Minute Power of 394W, or 5.02W/kg. His Peak 30 and 60 Minute Power were both set in the final parts of the stage. His Peak 30 Minute Power was 274W, or 3.49W/kg while his Peak 60 Minute Power was 255W, or 3.25W/kg. Similar to Durbridge’s file, Valgren’s peak power values are spread throughout the stage. Like Durbridge, Valgren also set his Peak 5 Minute Power at the start, averaging 357W, or 4.93W/kg. Valgren’s Peak 20, 30, and 60 Minute Power values all together starting around the 60km mark. For his Peak 30 Minute Power, Valgren averaged 256W, or 3.54W/kg. Unlike Durbridge, Valgren’s Peak 1 and 2 Minute Power came at the end of the stage. Valgren pushed 456W, or 6.30W/kg for 2 minutes and 504W, or 6.96W/kg for 1 minute. Welcome to the Pyrenees! This year’s tour hits these mountain stages early which will test the riders over the next three stages. This first stage starts in the town of L’Isle-Jourdain and travels southwest on a slow steady false flat incline to Boulogne-sur-Gesse at 50 km into the race. From there the course turns west through rolling hills before making the turn south at Chelle-Debat at 90 km. Riders will then prepare for the first of two categorized climbs on the day the long but lower grade category 4 climb up Côte de Capvern at 117 km. Sprinters will vie for the intermediate point right before the gradient really kicks up for the category 1 climb up the famous Col d’Aspin, a 12 km 6.5% gradient beast. The stage however does not finish with a mountain summit as riders will have a 5 km descent with some switch backs that could bring the GC riders all together before the last 700 meters of slight 3.5% uphill to the finish at Lac de Payolle. While relatively flat until the final kilometers, it was not easy. Valgren had a Normalized Power® (NP®) of 276W for just over three hours before the start of the day’s final climb. 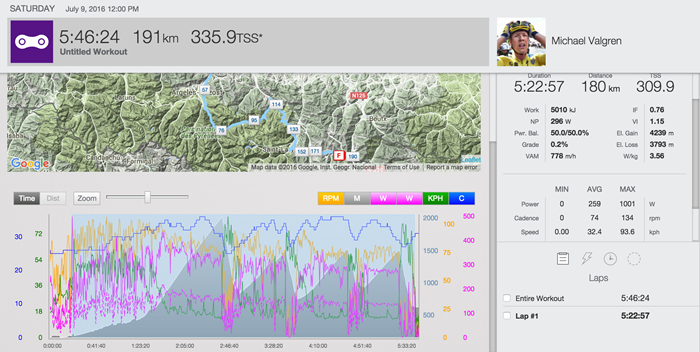 At the base of the Category 1 Col d’Aspin, Valgren put out his Peak 10 Minute Power of 378W, or 5.22W/kg. Up the 12km climb, Valgren averaged 298W, or 4.12W/kg for approximately 40 minutes. His average speed was 18.7kph (11.5mph) and 82rpm. Stage 8 will have 4 difficult categorized climbs over the 184 km course. The race kicks off in Pau heading southeast out of town and turns east at Luz-Saint-Sauveur where the road starts to get steeper as the riders approach the Col du Tourmalet. This is a 19 km climb at 7.4% average grade Hors Categorie (HC) climb that starts around 67 km. Then an 18 km descent through the town of Sainte-Marie de Campan. The incline towards the category 2 climb up Hourquette d’Ancizan starts immediately on the way out of town. While only 4.9% grade at 8.2 km long, the climb will keep the pressure on. The descent features narrow steep roads into Guchen and on to the category 1 Col de Val Louron-Azet. The descent off of this climb has a series of 10 switchbacks on the way into Loudenvielle. The final category 1 climb before the run into Bagnères-de-Luchon is the Col de Peyresourde, which at only 7.1 km long has an average gradient of 7.8%. The descent into the finish is much less technical and flattens out over the last 4 km with several tight turns in the last km to the line. All of Valgren’s Peak Power values longer than two minutes included the Hors Category climb of the Col du Tourmalet. His Peak 20 Minute Power was 373W, or 5.15W/kg and he averaged 21.5kph, or 13.3mph and 90rpm. On the final climb of the day, the Category 1 Col Peyresourde, Valgren averaged 273W, or 3.77W/kg for 32 minutes and 75rpm. Over the full stage, Valgren averaged 259W, or 3.56W/kg and burned 5010 calories. An indication of how hard the stage was, Valgren had an Intensity Factor® (IF®) of .76 and Training Stress Score® (TSS®) of 310. The last stage before the first rest day of the tour is also the final day in the Pyrenees. The tour has decided to test the riders before they are allowed to relax for a day with three category 1 climbs, a category 2 climb and a mountain summit finish up the Hors Categorie Andorre Arcalis. Right from the beginning heading southeast out of the Spanish town of Vielha Val d’Aran riders will start the ascent up the Port de la Bonaigua. After a fast descent into Sort riders face the second category 1 climb up Port del Cantò. THis climb is not as steep as the first, but is longer at 19 km. The descent off the climb is a bit more technical, but the roads are wide and fast. As the course passes through Adrall it swings back north away from Spain and towards Andorra. The long sustained incline hits the intermediate sprint point just before the start of the category 2 climb of Côte de la Comella. Riders will almost immediately go into the Col de Beixalis with an average grade of 8.5% for 6.4 km. The final test will be up the HC Andorre Arcalis which features a series of 12 switchbacks in the last 5 km at an average grade of 7.5%. Despite 3 Category 1 climbs and Hors Category climb at the end, Stage 9 was hard from the start. Valgren set his Peak One Hour Power in the first hour, averaging 309W, or 4.27W/kg while ascending the Category 1 Port de la Bonaigua, the first Category 1 Climb of the stage. One the day’s second Category 1 climb, the 20km long Port del Canto, Valgren averaged 276W, or 3.81W/kg. His Peak 90 Minute Power was set between kilometer 118 and 159, which included Category 2 climb up the Cote de la Comella and the third Category 1 climb, the Col de Beixalis. He averaged 258W, or 3.56W/kg and burned 1394 calories during this period. Amazingly, Valgren was still able to average 292W, or 4.03W/kg ascending the 10km long Hors Category climb to the finish. He averaged 16.3kph (10mph) for nearly 40 minutes. Over the full stage, Valgren averaged 235W, or 3.23W/kg, burned 4845 calories, and hit a top speed of 97.2kph (60mph).